just click on the Sanctuary logo of your choice. 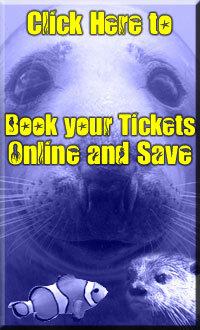 The Cornish Seal Sanctuary is set in the picturesque Helford Estuary, by the beautiful village of Gweek, in Cornwall. The Sanctuary is a busy rescue centre, and also has resident Grey Seals, Common Seals, Patagonian & Californian Sea Lions, Penguins, Otters, Goats, Sheep and Ponies. At the Hunstanton SEA LIFE Sanctuary you can embark upon a fascinating journey beneath the sea and come face to face with species as diverse as Sharks, Otters, Penguins, Green Sea Turtle, Rays and Seahorses. The Sanctuary is also a busy rescue and rehabilitation centre for both common and grey seal pups. Located on the North Bay of the main headland, within three iconic triangular buildings, Scarborough SEA LIFE Sanctuary offers a unique mix of indoor and outdoor exhibits and over 50 displays of marine life including seals, otters and penguins. Enjoy SEA LIFE Europe´s only penguin walkthrough feature. The Scottish SEA LIFE Sanctuary is now closed.